Winning a public-art commission is all too rare for most sculptors. Even rarer is getting a college quad named after you. Both those opportunities collided today — albeit were in the works for months — when Champlain College president emeritus David F. Finney was honored in a surprise (to him) ceremony at the newly renamed Finney Quad. In addition, a $2 million Endowed Chair for the Future of Professional Education in his name was announced at the ceremony, a gathering of campus and community members and supporters, and led by new president Donald J. Laackman. Finney retired on June 30 after leading the college for nine years — a period that has seen tremendous growth, including the construction of student housing and other campus buildings, the development of new degree programs and, not least, the establishment of the Robert P. Stiller School of Business. For that last accomplishment, Finney secured the school's largest single gift ever. And the public art commission? 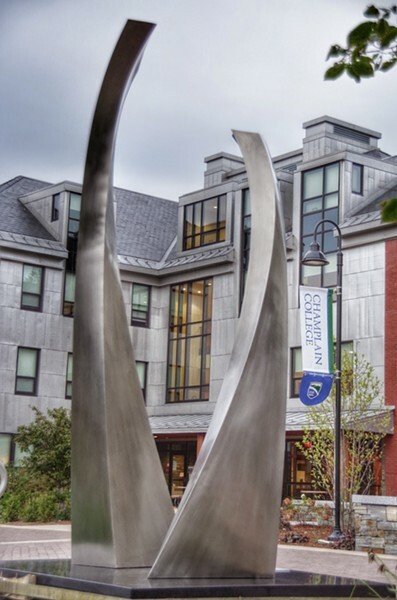 That honor went to Stowe sculptor Chris Curtis, co-owner of West Branch Gallery & Sculpture Park, for his steel-and-granite work titled "Audeamus." Aptly, the piece is installed in the center of the new quad on the Burlington campus at Maple and South Willard streets. Its Latin name is derived from the school's motto, and also honors Finney's "let us dare" spirit. The 10-foot-tall sculpture consists of two similar but not identical abstract shapes — Curtis calls them "sort of distorted rhomboid prisms, twisted around a center point between them." Swooping upward from a granite base, they spiral slightly toward each other. The nonrepresentational figures are symbolic, and clearly imply interaction. The sculpture "contains this idea of persuasiveness that Finney possessed," Curtis explains, "by virtue of his intellect and ability to bring people to his vision." The taller figure can be seen as a mentor, the slightly shorter one a student, he adds. "Audeamus" represents both Finney's educational focus on dialog and discussion and his audacious positioning of the college. Finney led Champlain College through a period of dramatic growth from 2005-14. During his first year, the faculty passed a new four-year Core Division curriculum that took a broad-based interdisciplinary approach to traditional courses and set the stage for global education opportunities. The Life Experience and Action Dimension soon followed, offering life skill, community service, career management and financial sophistication programs. Finney also established international campuses in Montreal, Canada, and Dublin, Ireland, and successfully expanded the Burlington campus facilities with a focus on sustainability, earning the College national recognition. He expanded the graduate and online adult education opportunities and tripled undergraduate applications and student enrollment; he also strengthened financial aid and established new scholarship programs. Last year, Champlain was named "the ideal college" by the Atlantic magazine. It's been consistently ranked among top-tier small colleges in the U.S. And now, its got some audacious public art.